In the world of boutique hotels, many were becoming formulaic, type cast. 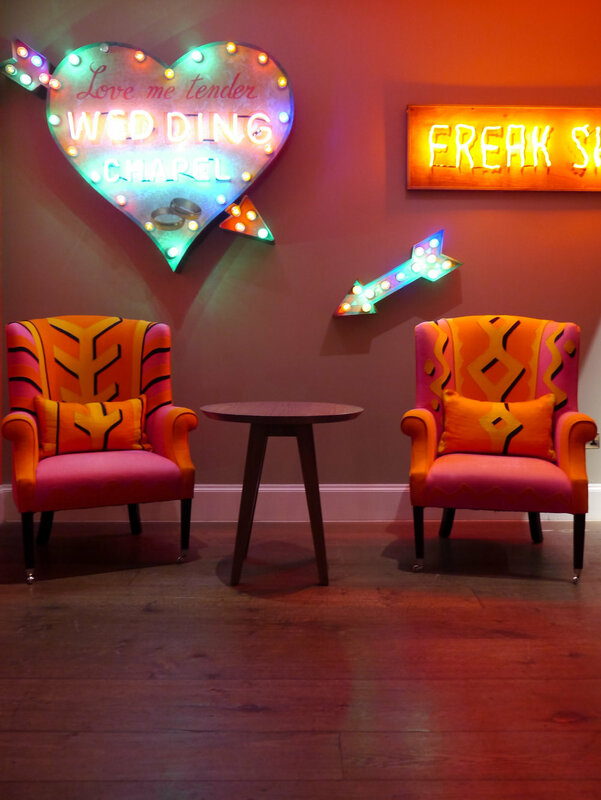 Ham Yard Hotel is the perfect solution. A village like oasis for the jaded traveller in the very heart of London. Indeed, just how did Tim and Kit Kemp find a spare 3/4 of an acre languishing behind the neon signs of Piccadilly Circus? Well, this area of Soho was ruined by the blitz and remarkably still unloved until Firmdale bought the site back in 2009. In so doing they embarked on breathing life back into this area of Soho, carving out a small village, Ham Yard Village, linking Great Windmill Street and Denman Street. Full of 13 charming independent boutiques arranged around a cool oak tree lined courtyard. With Frescobol Carioca, for your summer essentials; Brummells of London, for grooming and beauty finds; and Engawa Restaurant, for Kobe Beef and Sushi that all resemble miniature masterpieces in an authentic modern taste of Japan. The hotel itself which stands along one side of the wrap around U-shaped courtyard, is purpose built and reminiscent of the unique architecture of Soho with its full length industrial Crittall doors and windows. A design that seeks to bring the outdoors inside and turn the indoors outside, making every room and space full of natural light. This is a contemporary hotel, experientially different, unhurried, offering a genuine welcome to travellers and Londoners alike. Tim and Kit Kemp are redefining the meaning of luxury, investing in the community and well made design. Only Kit Kemp could pull off this design with all its visual surprises. Instead of being kitsch, or an overload on your senses, the whole hotel has a air of adventure and energy. This is witty english luxury, perfectly balanced and purposeful. The drawing room has a hand painted Scandinavian bureaux and French fireplace. The Croc bowling alley, yes there is a bowling alley, named after the enormous driftwood crocodiles hanging on the wall is an imported 1950's Texas alley made by the iconic Brunswick company, furnished with South African sofas, vintage bowling pin lamps and two enormous Howard Hodgkin paintings and Alexander Calder tapestry. The roof terrace is like walking in to an english country garden, a carpet of lavender and herbs, with a vegetable garden and two bee hives, all harvested for the restaurant downstairs. Every room and space is given its own bespoke design individually decorated and furnished, from its wallpaper to the fabric on the chairs or art hanging on the wall. Kit Kemp draws together on all her experiences and travel to create an eclectic bohemian mood, where nothing is ever too serious, making it fun and cosy. This hotel is a great many things; contemporary, traditional, unique, colourful, welcoming, comfortable,but the overriding feeling you are left with is how positive it all is, how much fun, joyous. A remarkable achievement. Now you have to go and see it for yourself. Images above via Firmdale Hotels, Photo credit Simon Brown Photography. Don't Miss the beautiful 135-dial digital clock, by human movement 1988, in the lobby - Each of the hands on the small traditional clocks have been synchronised to work together to display the time in a much larger digital format. As well as displaying numbers, the clocks can also work together to form complex geometric shapes and movements. THe Ham yard tonic - PORTOBELLO road gin, campari, st germain, grapefruit bitters, and homemade tonic. dinosaur designs - one of the independent stores in the courtyard, much loved australian ACCESSORIES brand - Stephen Ormandy, Only Dancing Book, Only Dancing is the first publication dedicated to surveying Ormandy's ( one half of Dinosaur designs) vibrant, large-scale oil painting and the playfulness he brings to everything he does. AUD$ - 55.